Outside their uniform, Lozano and Lozano-Landinez are indistinguishable from other Stanford students. They take CS 106A, wait in line at The Axe and Palm and wear sandals to class. But for 27 hours a week, Lozano and Lozano-Landinez study a parallel military science curriculum in subjects like military leadership and lead platoons on training marches in full military garb. ROTC has kept a low profile on campus since it was officially removed from Stanford premises in 1968 amid anti-military sentiment and two arson attacks on the Navy ROTC headquarters on Galvez Street. Gradually, that sentiment has faded over the last 40 years, and the Faculty Senate pressured the University to reinstate support for ROTC in 2013. Dustin Noll, Stanford Office for Military-Affiliated Communities specialist, attributes the gradual return of ROTC to a paradigm shift in the nation’s attitude toward the armed forces and the military-industrial complex. In the 1960s, the military affected more Americans directly because of the draft. Before ROTC’s official return to Stanford, cadets were not given any academic credit or funding. 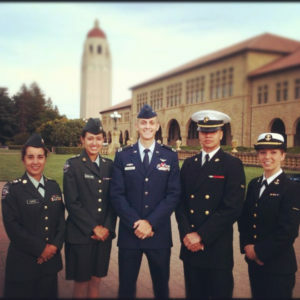 ROTC students were responsible for finding their own way to training at bases as far away as the University of California, Berkeley. ROTC’s presence at Stanford remains modest compared to its height in the 1940s and 1950s. During the Second World War, around 50 percent of Stanford undergraduate males were ROTC cadets, peaking in 1956 with over 1,100 student officer trainees. However, the ranks soon began to shrink, leaving only a few dozen cadets left when the Faculty Senate removed ROTC from campus 13 years later. In the aftermath of 9/11, ROTC boasted 29 cadets from all three ROTC branches of the Armed Forces: Army, Navy, and Air Force. Since ROTC returned to campus, there has been an average of a dozen cadets per class year. This year, there are only 11 members in total – two Army cadets, seven Navy midshipmen and two Air Force cadets. For its undergraduate members today, ROTC is as much of a pre-professional experience as an internship or a part-time job. Cadets join and drop out of the program at will, while many cadets come from military families or see a military career as a way to support their country. Balancing the demands of a Stanford education and ROTC work can be tough. Training often takes place in the early mornings and requires extra focus and study time. Cadets are required to spend a significant amount of time each week off-campus, hindering them from participating in the full range of student events. Additionally, cadets are not permitted to consume alcohol or smoke. Captain Cole Moses, who serves as an Army ROTC Instructor, said that the demands of the program are not waived for Stanford students, even though they must commute to reach the base. “[The Army cadets] still get called in randomly, because the cadets run the program, so if a senior wants to have a meeting, they actually expect someone from Stanford to get in a car and drive down there,” Moses said. Lozano-Landinez agreed that the time commitment can be extensive and sometimes unreasonable, pointing out that many students who join ROTC purely for financial reasons do not continue. “Understand your options, and if it’s something that you’re truly interested about, pursue it,” Lozano-Landinez advised. However, some cadets have found the rigorous training helpful for their studies. Acosta explained that ROTC taught her leadership and time management skills early in her college career. “Last year, I got thrown into a leadership position as a freshman, which was really overwhelming at first. But it made me grow as a leader,” Acosta said. Many of the cadets are placed in “sink-or-swim” leadership situations where they have to take command of a group of cadets and make quick decisions. Air Force ROTC cadet Kalvin Parker ’18 said that because of ROTC, he has little patience for indecisiveness and procrastination over group projects. When ROTC cadets and other active members of the military wear their uniforms around campus, they are met with mixed reactions. Marine Corps Lieutenant-Colonel Eric Reid, a National Security Affairs Fellow at the Hoover Institution, said that many people are simply unsure of how to respond to the uniform that distinguishes members of the military from civilians. According to Reid, people often thank him and other military personnel for their service as a conversational crutch because they do not know what to say. Not every interaction is positive or even neutral. During his freshman year, Lozano was called out as a “baby-killer” and for helping propagate the military-industrial complex while wearing his combat uniform. At the time, Lozano simply responded that he was not a baby-killer. Looking back, he said wishes he had taken the time to explain further what he does. Because of this and other negative interactions, Lozano tries to wear his uniform only when necessary as he wants to be known as more than just a ROTC cadet. After long experience, Reid took a more circumspect view of the reactions that come with the military label. Reflecting on ROTC’s complicated history at Stanford and its modest campus presence even today, Parker hoped that more Stanford alumni join the military service to the benefit of both the University and the military. Contact Josh Wagner at jwagner4 ‘at’ stanford.edu.